Today, almost everyone owns a car, or a bike, that is, a vehicle with tires. But, when it comes to tires, they have a tendency to deflate. That’s why owning a tire inflator is very handy. We will present you the best tire inflators 2019 will offer. In this article we will include a small comparison table, we explain good and bad sides of 10 tire inflators and we will include users’ opinions about them, you’ll be more informed in general because we have a small buyer’s guide included, and you’ll learn a fair share about safety. So, buckle up, we’re off to a world of deflating and inflating. Read Also: How to use a portale air compressor. At the end of this article, you’ll have a fair share of information about tire inflators and we’ll include so much information, you’ll feel like a pro. Go on, read an article about top of our best tire inflator in 2019’s list. Before we start presenting best tire inflators, we made a small comparison table with most important facts. After this table, you’ll read about best tire inflators 2019 has to offer. Most of the users agree that this is an excellent product. Because it's fairly small, it's portable and easy to carry around in your car, it doesn’t take too much space and it’s user friendly. It is powerful and well made, and for its size, it works like a charm. It comes with a bag, described as premium, which is made of nice materials. It has a power cord that you can plug in to a cigarette outlet, and users are very satisfied with how long the cord is. Few of them said that you can go all around four tires, meaning you won’t have any problems with length if you’re in need of it. Another praised thing is the noise, or the lack of it. This tire inflator is surprisingly quiet. One of the particular problems is the pressure gauge which sometimes causes the blowing of the fuse. It seems that sometimes it doesn’t work properly, and the tire pressure is not at its maximum after the tire inflator has been used. Also, the car is supposed to be running while you use the inflator, because the power source is cigarette outlet. You can use the inflator while the car is not running, but not at its full potential, thus the psi won’t be good. It has a LED light included, which is a nice touch, especially for those who will be using the inflator at night. Because this inflator is made out of rubber, that prevents vibration, meaning that little to no air should escape while you’re inflating your tires. This genuinely is a good product. Being small and ﻿quie﻿﻿t, it makes it portable and desirable because it won’t take up too much space nor disturb people around you. But, the fact that the pressure gauge can fail and hence not work properly is alarming. You’re paying for a product that will inflate your tires, not a product that will pretend to do it. Also, the option about this inflator not being able to work while the car is not running kind of ruins the positive vibe about this product. This little thing's purpose is not only to inflate flat car or bike tires, you can also use it to inflate air mattresses, lawn mover’s tires or toys for the beach. It’s pretty powerful, at 250 psi, the strongest in our list. You can’t plug it in the wall but to a cigarette outlet in your car. It’s not very big, and users are complimenting its lack of noise while it’s running. Thing that is rather curious is that this tire inflator is yellow. It doesn’t have a LED light so it would be rather difficult to use at night, but because it’s yellow, it’s a like a beacon during night hours if you have to inflate your tire. So, you won’t be in danger of hit and run, that’s good news. Again, like with our previous model in the list, this tire inflator won’t work unless the car is running. So, in order to achieve maximum strength and pressure, the car has to be running. It will depend from your needs of course, and most of the tire inflators are not too expensive, but if you’re searching for something different, this won’t be the product for you. This tire inflator has a great option that our users are swearing by, and it’s a preset function where the inflator will automatically shut off when the pressure is at its optimum (maximum). Plus, it can read the pressure in your tires when you’re not pumping air into them. It’s made out of plastic, not metal, which is why it’s lightweight, but because it’s made out of plastic, it doesn’t cancel out vibration. It will rattle a little while you’re using it on the ground, and it will probably move. Most of the users agree that this tire inflator is very handy to own. Being lightweight and small, it makes it portable and easy to store somewhere. But due to its lightweightness, there’s no such thing as vibration control or cancelation. Also, the car has to be running for your inflator to work, which is okay if you want to inflate a car tire, the problem can occur if you want to inflate something else. LED light is not included, which would in general be a great addition. It’s “only” of yellow color, but that doesn’t help you see in the dark, it can help other people see you, and not get run over. Now, we have a product with mixed opinions. Where some users are happy with it, some hate it. This tire inflator is made mostly for inflating car and bicycle tires and if you want to inflate other things, like air mattresses or beach toys, you’ll need a special adapter. It’s not generally a minus, because we are talking about tire inflators, but it’s always a nice addition when something is versatile. It’s very light, weighing only 2 pounds, so it means it portable and easy adjustable. LED light is featured, so you’re sure when the night comes and you need that extra light and extra air in your tires. Psi is 100 and it works like a charm. It takes around 8 minutes to inflate a tire from being total flatness to an optimum. Again, you can’t plug it in the wall, its power source is a cord, but also a cigarette outlet. Unlike other models we presented, users have complaints about this cord. It’s not very long, only 6 feet, and on top of that, when you take it out of cigarette outlet, it can really burn your fingers. Ouch, not good. It doesn’t have an autostop function, meaning you can’t really program the tire inflator when to stop, you have to do it the oldfashioned way by paying attention to the inflator. As we stated before, opinions are mixed, to say the least. One of the biggest flaws is the overheating of the tip of the power plug. Although it’s not dangerous, it certainly isn’t pleasant to burn your fingers and it’s something that needs to be improved. Because it’s lightweight, there’s also no vibration control which makes this tire inflator little difficult to use. The automatic shutoff option, or the lack of it, makes this product less desirable than others, but it does have a LED light, which is always a nice addition. The cord is also not very long, and even though users’ reports are mostly positive about it, it wouldn’t hurt if it were longer. It’s portable and easy to use, which makes this tire inflator a nice product, but there are things that speak against it. It’s not versatile because it’s made only for tires (hence the tire inflator) but it would be a nice touch if you don’t need to buy a special adapter for other purposes. Okay, now we're talking. This is the first model in our list that can be both plugged into a wall through a power cord and charged like that, or be used from a cigarette outlet in your car. It can work cordless and there’s a battery included, and you have to charge it, of course, before using it. Many users say that this particular Slime model is an upgraded version of its younger brother Slime 40032 because it has some variations that previous model doesn’t. First and foremost, if you don’t want to be bothered with cords, this is a product for you. The power cord, though, is only 6 feet long, but given the fact it’s cordless, hopefully you won’t need it. It’s lightweight and portable, and it’s highly possible you’ll use it more than once. Plus, you’ll know when to recharge its batteries, because this tire inflator has color indicators that will alarm you when needed. It’s not too loud, but then again it does make noise. Most users won’t use it at night in a garage due to the noise it makes. LED light is not included. It’s not as light as you would expect, but it’s not a problem, it doesn’t make it less portable. It’s also versatile as it’s portable, unlike its predecessor. You can use this model not only on tires, but on various other things that need to be inflated because all sorts of attachments are included. Thumbs up for versatility. On the not so bright side, there are users that state that this particular product is not built to last. Whether it’s because of the materials it’s made, we don’t know, but there are experiences that indicate short life span, to use that expression, of the tire inflator. Some of them said that this model didn’t last more than 10 months and that they’ve spent money in vain. One of the great things is that this is cordless tire inflator and its versatility is really very good. But, even though it’s presented as its predecessor’s upgraded model, not so much is really upgraded. Great addition is the battery indicator color scheme, but it won’t make up the apparent lack of LED light. There isn’t too much noise involved, but it’s present. That maybe isn’t a big problem, but it will all depend on your needs and what you want from your product. Great drawback is its short lifetime, because no one wants to pay for something that will stop working after a short period of time. This inflator is the one that has the most user reviews on Amazon and it has a great average rating. It’s a nice and solid product of about 60 PSI and it doesn’t produce too much noise. Great addition, you’ll be able to use it everywhere because it’s fairly quiet, you won’t disturb anyone with it. In order for this particular model of tire inflator to work, you’ll have to plug it in the cigarette outlet while the car is running. The cord is 10 feet long and the air hose is 3 feet long, thus making it easy to use. Good length of the cord is always a plus. It comes with a small canvas bag in which it’s placed, and you can move it around without worry you’ll lose some crucial part of it. If you’re stranded on some road with a flat tire and without light during night, do not worry, because this tire inflator will come to the rescue. This model has LED light built in, and you’ll have no troubles using it during the night. It will illuminate the tire and the area around so you don’t have to scramble with the light from your cell phone while trying to plug in some other device that doesn’t have this feature. Now, one of the downsides of this tire inflator model is that it blew out their fuse. That usually happens when you’re not checking the max amperage, so be careful. Nonetheless, it shouldn’t happen, given the fact this tire inflator isn’t very cheap. Also, some users are complaining that when you detach the air valve from a tire, it will let out a small amount of air from it. Not really a problem, but if you don’t pay attention to that, why bother inflating a tire then? It’s not versatile. It is advertised as only a tire inflator, and you can’t use it for inflating anything else. It’s designed only for inflating tires, and no additional part you buy can change that. Even though this tire inflator is very nicely built and you can move it around, it’s a shame it’s not built for inflating other things. If you plan on inflating more things than just tires, don’t buy this product. LED light is always a great addition and it is one of the best things about this model. Blowing out the fuse, it seems, is the frequent problem of most of the tire inflators. You shouldn’t have to pay attention to those details once you’re parted with your money for a product. We would say that the biggest minus is detaching the air valve from a tire when it lets out some air previously pumped inside that same tire. It can’t happen and it is a thing worth considering before you buy this product. 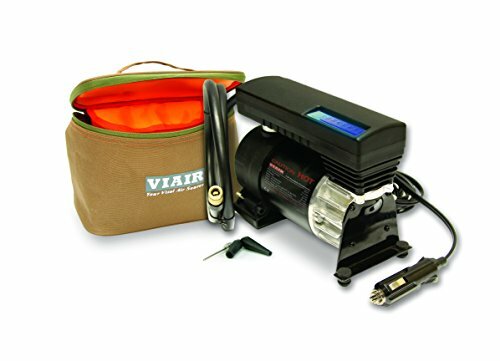 One more model from the VIAIR family. It is advertised as the most popular tire inflator model. It packs up nice amperage at 120 PSI, it’s made mostly of metal but the amp rating is made of rubber. It doesn’t sound nice when we start description with a bad thing, but here it goes. Some users have reported that they could smell the rubber after using the inflator (or even while using it). It didn’t burn, but the smell lingered. No one actually reported that the rubber did burn, but that’s probably because they stopped using the inflator after that. The power cable is 17 feet long, so you’ll really have no problem in that department. Now, a good thing. It can’t be connected through a cigarette outlet, but the good thing is that it can be connected to the battery with clamps, and it makes different from other models. The car has to be up and running for the clamps to be working, of course. If it’s connected through a cigarette outlet, it will blow up the fuse. The other part that’s made out of rubber is the bottom and it absorbs vibration. Great thing, not having to chase your tire inflator when it’s connected to the tire because it’s not hopping around. Apart from the previous model in this list, this one is versatile. It can be used to inflate lots of things, not just tires. It would be great to have it now for inflating pools and balls to play with in a pool. It’s not very big so you can place it anywhere in your car. Sadly, it doesn’t have an LED light, so hopefully you won’t need to inflate your tires during the night. Fortunately, it’s very quiet, so even if you have to inflate your tires during the night (in your garage, for example, where you’ll have light), you won’t wake up anyone because of the noise it’s making. Despite the fact this model is advertised as the most popular one, our users did find some major flaws among the great stuff this tire inflator has to offer. We really think it’s unacceptable for any product that has some components made out of rubber to emit burned smell. Our users didn’t use it long enough before it actually burned and we can’t say for a fact that it would actually happen, but again, it’s unacceptable. No LED light is also a minus, and for a product advertised as popular, it should be built in. Our users didn’t specify the exact troubles they encountered without the LED light, but they weren’t really too happy because the lacking of it. 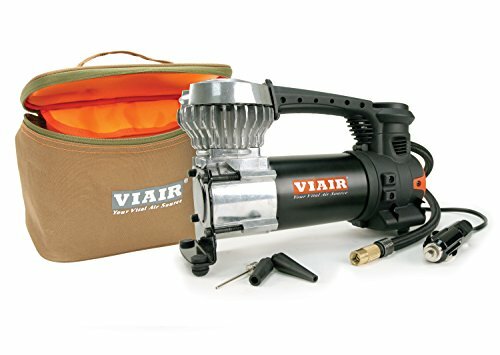 This is the last tire inflator we will be reviewing from the VIAIR family in this article. And, it’s the priciest one from the family. It can be used for 33 inch tires, which not all tire inflators can do, meaning it can inflate truck tires fairly easily, packing 150 psi. This is not only tire inflator, it’s more of an air compressor, and that being said, it can also be used for deflating tires. Pretty neat, depending on what you need. Given its size and weight, you’d think that this is one bulky and loud tire inflator/compressor. But no, satisfyingly, it’s reasonably quiet. Again, the connection to the battery is with the clamps, they are heavy duty and the vehicle has to be running, of course (like all others), in order for the inflator to do its magic. Nice addition is that this product comes with a bag, so you don’t need to shuffle it around your car, it will always have its place where you can find it without searching. Plus, the bag has multiple compartments, so you can keep inflator parts inside. It comes with a sand tray that will cancel out vibration, and that is something that’s always welcome. However, it doesn’t come with a built in LED light, which is kind of a disappointment, because this is a heavy duty, well advertised product, and LED light would be a great addition to it. Coil hose is around 25 feet long but once you start using it, max length you can get is around 12 or 13 feet. That is okay, however you’re not supposed to stretch the coil around and all the way. You won’t be able to, not if you want max functionality. A lot of our users have bigger cars, Jeeps and trucks, and vast majority of them are completely dissatisfied with the length of the cord. Some even said that they were able to stretch the cord only long enough to inflate their front, and not back tires. From the standpoint of an average tire inflator, we would say this is a phenomenal product. But, given the fact it’s advertised as a heavy duty inflator/compressor, we can only say it’s not up to the task. The main problem is really the length, because if you say that it can inflate 33 inch tires, you have to consider the fact that you won’t find those tires on a, let’s say, Ford or Volvo, but you’ll find them on a Jeep or a van. They’re longer and bigger than an average car, and you need to make a longer cord than average. LED light is something that VIAIR keeps forgetting to install to their inflators, even though users have complained about it a lot. We're leaving VIAIR behind us, and moving on to the new one, Kensun. This particular model has it rough on Amazon, and its average rating is 3,6 stars on Amazon. Ouch. This product is, like the previous one, not just ordinary tile inflator, but it’s an air compressor, thus making it an inflator and deflator. You can use it to inflate (or deflate, for that matter) various things, from air mattresses to beach balls. We like versatility, because even though you’re buying a “tire” inflator, it’s always nice when you get more for the price. Various users who are having vehicles with bigger tires reported that they had no problems with inflating them. On the other hand, some users reported that the compressor just wasn’t strong enough to inflate a single beach ball. It could be just few bad products, but it’s worth mentioning it. The bigger problem are those reviews that reported the smoke coming out of a compressor. Apparently, those users were inflating their tires for several minutes when they noticed the inflator becoming hot, and shortly after they would notice the smoke. That’s not only a flaw, it’s a dangerous flaw. And, on top of that, it’s quite noisy. Good thing is that you can plug it in your wall electrical outlet or to a cigarette outlet in your car. That’s a great thing, if you have an electrical outlet near you. But, given the fact it’s noisy, maybe you shouldn’t do that in your garage at night. That being said, no LED light. Again. It seems like we have a lot to cover here. We would like to point out that you should never buy a product that can be potentially dangerous when you use it. If there were only one user review that mentioned smoke, we would ignore it. Because that’s not the case… If your product becomes hot after only several minutes of usage, and after that you notice smoke, it’s probable that a product is not worth the money. 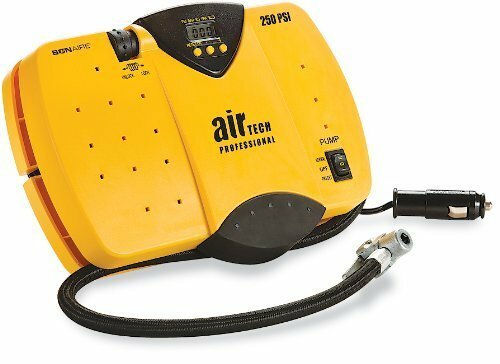 This particular tire inflator/air compressor is not quiet, and even that is not a quality that has a crucial impact on the end effect, it’s always nice if you don’t have to wear earplugs when you’re doing a minor task like inflating your tires. Bear in mind that this product is meant not only for average cars, but for bigger vehicles, so noisiness is understandable. One of the things that’s always welcome when you buy something is when you get more that one thing for the price. In this case, you’ll get a very nice bag for your tire inflator and everything that goes with it. One of the first things you’ll notice is that this inflator is rather small, compared to other products in this list. Usually, the size makes the product easy to store, and it’s no different with this one. You won’t have any problems putting it away in your trunk, it will fit like a charm. Kensun seems to like to make tire inflators/air compressor that are versatile. Again, this model can also be used to inflate various things, like beach toys or pool balls. Versatility is the key. It can’t be plugged into the wall electric outlet, though, it can only be connected through cigarette outlet like most of the models from our list. It can go up to 100 PSI, making this little guy pretty powerful. ﻿﻿It can inflate a tire in around 2 minutes. Downside is that it gets hot really fast, and you have to stop using it in order to cool down, after which you can use it again. But, it’s an enchanted circle, isn’t it. The cord is around 10 feet long, so it’s not suitable for bigger vehicles. It is very good for an ordinary, average car where you don’t have to stretch the cord to its limits. True to its size, it’s not noisy at all, and you can use it whenever you want without the danger of waking anyone up. As far as this product goes, the major flaw is that it overheats really fast and even though this one doesn’t emit smoke (nobody reported that), you have to wait some time before using it again. Some users said that the plastic parts that were hot broke into pieces, thus making the inflator broken and unusable. Also, some users were complaining about the hose being too stiff, and that makes it prone to damaging. After the comparison table we presented to you, and after describing each of the products to details, you should be equipped with knowledge about tire inflators. But, in case you still have some doubts about them, we will break the facts about tire inflators to even smaller details, and you’ll have no quarrels whatsoever about them when you’re done reading this article. Sit back and enjoy, we’re taking you to a detailed journey about what you must know about tire inflators. This one is pretty self explanatory, but let us meet and greet with the term. Tire inflators are inflating tires, and in most cases, they can be used in inflating various other things like air mattresses or beach balls. Pressure gauge measures the pressure in a tire or, for that matter, other types of objects that can be inflated. For an air pressure gauge to be good, it is supposed to be accurate and legible so you can inflate them to the wanted pressure. The gauge tell us what is current air pressure in the tire. Air pressure is important because it lowers the fuel consumption. Length of the power cord may sound like it’s not important, but if you paid close attention to our presentation of products, you could notice that we mention more than once how important it is. If the power cord is long enough, you won’t have any problems, let’s say, inflating your back tires if you have bigger vehicle. Plus, it lowers the hassle of stretching your cord too much and making your tire inflator to work at lessened capacity. As we pointed out, LED light is great when you have to work at night and there’s no other source of light available. Auto shutoff is a great addition, something that most tire inflators should have. It basically means that the tire inflator will shut off when the pressure in tires is at an optimum level and there won’t be no need for you to worry is the pressure level okay or not. The best thing about those new tire inflators is that it will auto inflate your tires. All you have to do is to sit back and enjoy, and wait for your tires to be inflated to the previously set amount of air that goes into the tire. Most of the tire inflator can only be run if you connect it to the cigarette outlet in your car, while the car is running. Because it’s not always the best option, some inflators have an option to be plugged in to the electrical outlet. One of the positives about this type of power source is that the fuse won’t be blown up, most likely, and you’ll have a steadier flow. Most of the adaptors for tire inflators are the ones you can attach for inflating other types of things that are not tire inflators. Not all tire inflators support them, though. Time of inflation will depend on the type of tire inflator and on the type of power course. The best scenario is when tires are inflated as fast as possible. The speed will also depend on the size of the tire that’s being inflated. That being said, tire inflators which power source are battery clamps are usually the fastest. Air hose should be made of quality rubber that won’t be heated in 2 minutes of usage and that won’t smell of burned rubber, like some models that we presented. You shouldn’t bend it this and that way if you want your hose to last and to not be damaged, which will later result in leaking of the air when the tire inflator is working, or in slower inflating. Not all tire inflators come with a bag, but the ones that do are always neatly packed and stored away. When a product comes with a bag, it automatically means you’ll have a place where to put your tire inflator and all the attached parts that came with it. Now, we did include some air compressors in our list because they’re good not only for inflating, but for deflating tires. Compressors are usually bigger and have more strength, are durable and can usually inflate/deflate a tire faster. PSI is something that will determine how fast your tires would be inflated. Additional lights are always welcome. They’re different from LED light because their purpose is not to illuminate tire inflator during night, it’s to warn the owner if the battery is empty, or just to show the state of the battery in general. Most of the tire inflators are built small, and they’re lightweight in most of the cases, which makes them pretty portable. One thing that’s great for their portability is a bag that comes with it, or the one you’d buy for storing the tire inflator. Some tire inflators are battery powered, which doesn’t mean that you can’t connect your tire inflator to some different power source. Battery powered tire inflators are maybe more convenient because if you’re in need of a tire inflator, but don’t have the means to inflate them in any other way, cordless and battery powered tire inflators are a life saver. Duty cycle is the length of time during which a tire inflator can work without shutting the tire inflator off for a cool down. The best tire inflators are the ones that can inflate tires for a long time before you need to stop using them due to overheating. Check out this section before you actually start using your tire inflator. Even though it’s great when a duty cycle is high, you shouldn’t use a tire inflator more than 10 to 15 minutes continuously. It will result in overheating and ruining a tire and tire inflator. Just because new tire inflators are basically selfoperating, it doesn’t mean you should leave it working unsupervised. Don’t assume that your tire is inflated enough, use the air pressure gauge. Make sure that the cigarette outlet you’re using is 15 amp, not 8 amp. It won’t work if you plug it in an 8 amp outlet, and it can result in a blown fuse. Don’t let your (or anyone else’s) children use a tire inflator. That’s not a toy to play with, it’s a serious device and if it’s wrongly handled, it can be dangerous. It’s possible that you’ll change more models of tire inflators in your life span, and not all of them will be the same. In order to handle your tire inflator properly, read the manual first, and after that start using it. If you’re lending your vehicle or tire inflator to another person, explain to them how to use that particular model of tire inflator. It will save you money if things go south. Today, almost everyone drives a car. It’s safe to say that all tires must be inflated, so you have to own a tire inflator. Even so, don’t inflate only your tires, inflate other things, versatility among inflators is high. Portable air compressor for car is something you have to have, and we gave our best to present you the best 2019 has to offer. Now you have the knowledge to choose one that will suit your needs, which was the purpose of this article. We hope you liked the article, and if you have any suggestions about some particular model we didn’t include, write it in the comments. Thanks for reading!